If you ever visit the city of Ulm in Germany you should desperately visit the beauty of Ulm. In case you have never heard about this sight artfour offers you today the chance to work out the secrets behind this antiquity. The beauty from Ulm is known as a mystery from old times. 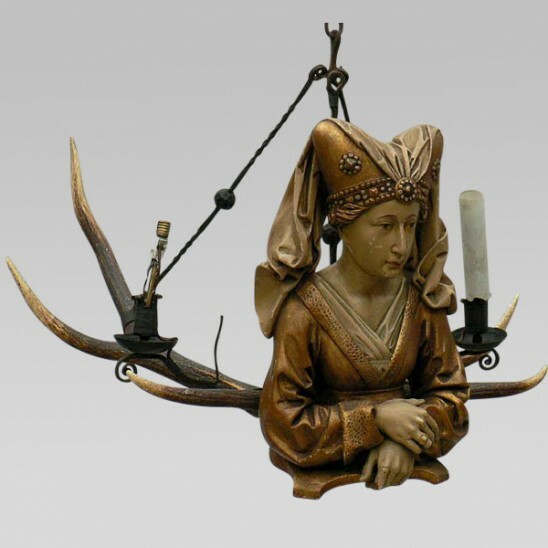 Although her origin and function is still devisive among experts it is the famous late Gothic art object of the museum of Ulm. Around 1475/80 Michael Erhart created a reliquary bust of Saint Mary Magdelene adorning the high altar of the Ulm cathedral. During Reformation the bust was released for burning but miraculously it was changed into a chandelier. Stag´s antlers had been assembled with fittings for candles - a beautiful luesterweibchen was born and adorned different rooms for decades. As late as the beginning of the last century the hidden treasure of the lovely luesterweibchen was discovered and reworked. Since 1934 the museum of Ulm presents its beauty without the stag´s antlers and it is defintely worth a visit. some 19 century lusterweibchen with the beauty of Ulm as archetype.